No matter how beautiful the night is, your camping trip would need a source of light to enjoy a bit more and most importantly for staying safe. Lighting up a few lantern makes the camping bit easy as you can perform your chores using this where natural moonlight is not enough. Sometimes campers use kerosene lanterns as a light source. But it’s too unsafe using fire inside the camp as it can catch a fire very fast. Many hikers and camp lovers loves LED lantern as they knows the need of clear bright white LED light while being in outdoor. The LED lights are green as it is free of toxins and some of these lights works on solar power. It works without fuel, save money and energy. Another benefit of using these LED light is that it doesn’t give fumes or doesn’t involve any inflammable products like gas or petroleum so that you can stay environmental friendly. Another benefit of using solar LED light is that it is low on maintenance; you can recharge it wherever on the go which in turn reduce the upkeep and keep the additional expanses low. 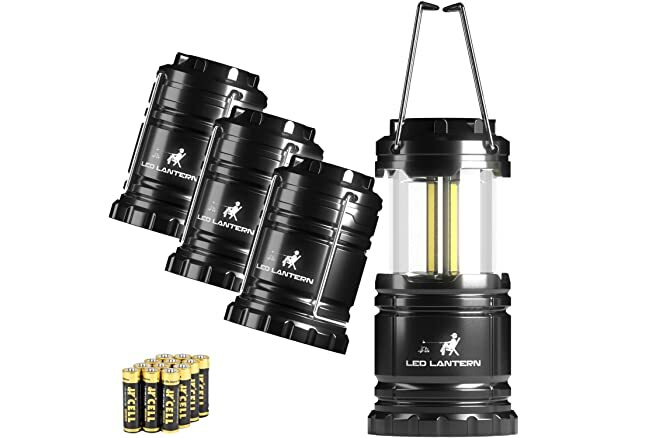 Though the old-school lantern fuels like propane and kerosene or the old-school lanterns itself are inexpensive but if you add the money of the whole year you invested to these lanterns you would be surprised to see the amount of money you invested on it. LED camping lanterns looks well and comes in various models with variety in different designs. Why should we choose LED technology? The technology of LED lights has recently taken over the market by storm as it is environment friendly, energy saving and also cost saving. These are the top 5 reasons to use LED technology. 1. The main reason of using an LED light is its energy efficiency. The LED light became so popular after the Clinton Climate Initiative replaced 140000 lights in LA with LED lights which till now saves $5 million annually. The outdoor LED lanterns are solar and these LED lights are life saving and environment safe option. 2. Another reason for using a LED light is its longer life span. An average CFL has a lifespan of 8000 hours whereas a LED light has a lifespan of about 50000 hours or more. That means it can last up to a lifetime. 3. LED lights emit bright white light. LED lights emit white light in higher intensity than CFL. With the LED lights the campers and hikers see things far better than normal lantern or natural light. 4. LED lights are free of toxic products and it is also 100% recyclable. This helps people reduce their carbon footprint up to a third. We can safely tell that LED bulbs are greenest bulb so far ever made. We suggest you with the Best Outdoor LED Lanterns, hope you choose the suitable one. 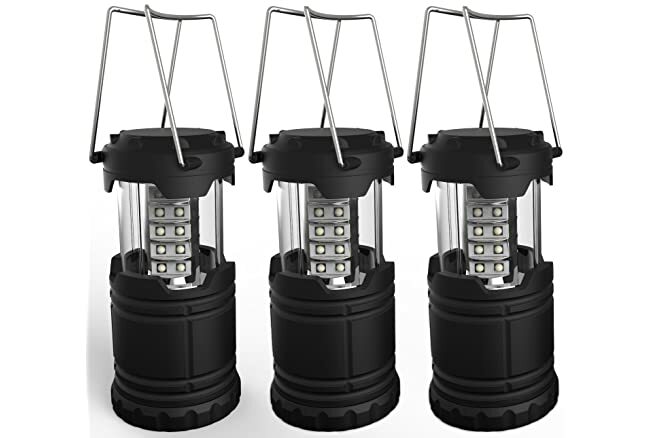 The Etekcity 3 pack Portable Outdoor LED lantern is perfect for many situations, be is camping or power cut, it is always present to save your night as it emits lights up to 12 hours of continuous use. It has energy saving mode with which it can run up to 4 hours in extreme low power. The exterior is made out of military grade material. • The lantern is extremely lightweight so that it can be carried anywhere at ease. • When you are not using the lantern, you can collapse it into really small and pack it. • The outside is constructed with military grade, long time durable material. • It comes with 9 AA batteries and 10 years of warranty. • This lantern is not chargeable so you always have to change the batteries more frequently. • The Etekcity 3 pack portable LED lantern doesn’t include solar panel. Latest Chip-on-board LED technology illuminates more area as it emits 300 lumens. The lights are brighter than the other 30 LED lights. The lantern is made out of military grade plastic material. The type of the light is warm which keeps your sleep rhythm intact. It has 12 hours of battery life even after continuous use. • It has the brightest light amongst the other 30 light bulbs of its range. The chip-on-board LED lamps give 2X light as it emits 300 lumens. • Its advanced collapsible design makes it foldable and easy to carry. • The company gives this lantern 15 years of warranty. • The lantern is made of 100% military grade material which makes it extra durable. • It emits warm light which leaves your sleep rhythm alright and helps you avoid insomnia. • This lantern is not waterproof. • This lantern is not chargeable by sunlight. This lantern is made of durable plastic. The 30 LED bulbs are bright and durable and give bright white light all over the room. The LED lights emit 60 lumens. 3 AA 1.5 Volt batteries are included in the pack. It is extremely lightweight and can be easily pack as it can be folded into your luggage within a small space. • This product is made of super durable ABS. This material is durable, lightweight, water resistant and scratchproof. 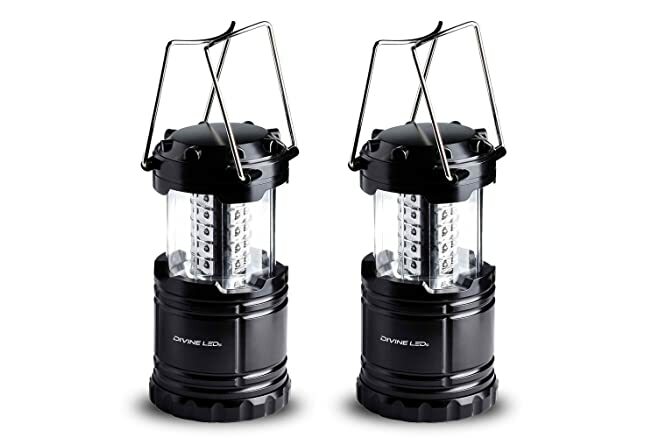 • This lantern is convenient for the environmental emergencies like the hurricane or any storm. • 30 durable lights are there to emit 60 lumens of light with 360 degree wide angle illumination all over. • It can be used continuously for 10 hours. When the battery starts to drain, the lantern goes into energy saving mode. • These units don’t have a magnetic base. • This lantern is not chargeable. So you have to change the battery every time it drains. The MalloMe LED camping lantern is the brightest lantern available in the market. This lantern is made of 30 very durable and bright LED lights which emits 360 Lumens of light around all over the room. The material that it is made of is military grade and designed to last almost a lifetime. 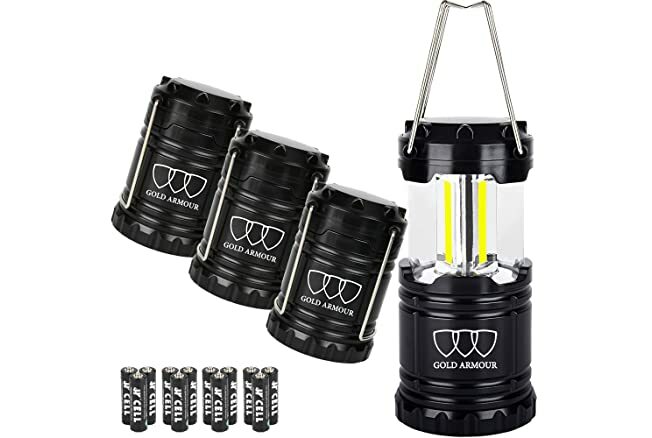 The light lantern set is providing you with four extra bright LED lantern powered by COB lighting technology. • This lantern has 30 durable LED lights emitting 350 lumens of light all over. • It is made of high quality CE and ROHS approved military grade material, which lightweight and equally durable. • The LED bulbs can last for a lifetime as it has the lifespan of 100000 hours. • It can be folded into a very small space. So it is travel friendly. • The batteries are not chargeable so removing the batteries after draining is must. • Solar panel is not included. This lantern is special as it is hand built from durable military grade plastic. The rugged outer body and the design are made especially for using it in all conditions. The lantern is easily collapsible as it unfolds and folds very easily. It has 30 LED array. The battery is AA and rechargeable. With full battery it has 12 hours of life. • After giving maximum light for 8 hours, it turns to 4 hours of power saving mode in which the intensity of light becomes less. • It’s a 360 degree brightness lantern which illuminates the whole room. • A little push folds it to a compact unit which is very easy to pack. • The lantern is made up of very durable military grade plastic, which makes it long-lasting. 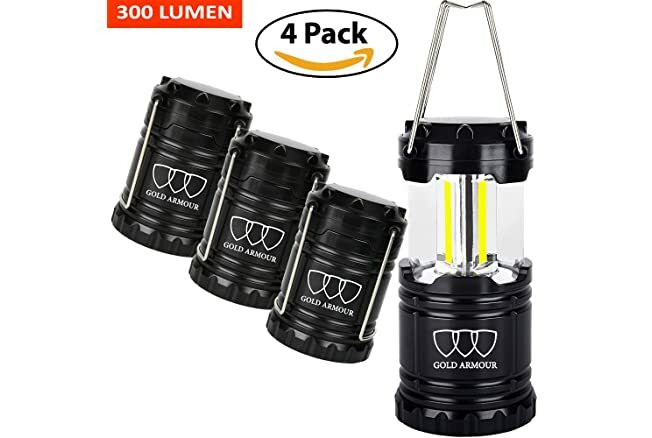 • This lantern is water resistant. • Battery is not included. You have to buy it yourself. • Albeit it is water resistant, it is not waterproof. 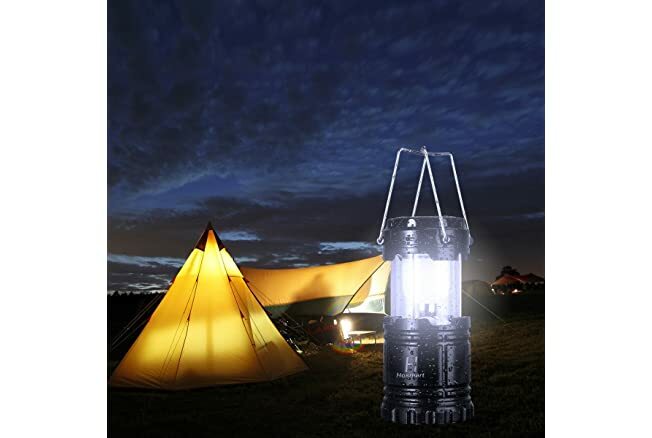 This camping lantern has the latest LED technology and has three 48 mm COB strips which illuminate 360 degrees. The brightness of the light emitted by this lantern is twice the old-schooled 30 LED lanterns. There is also a flashlight at the base of this lantern, so than you can have dual support when needed. • This lantern is super bright. Almost 2X brighter than normal LED lanterns. 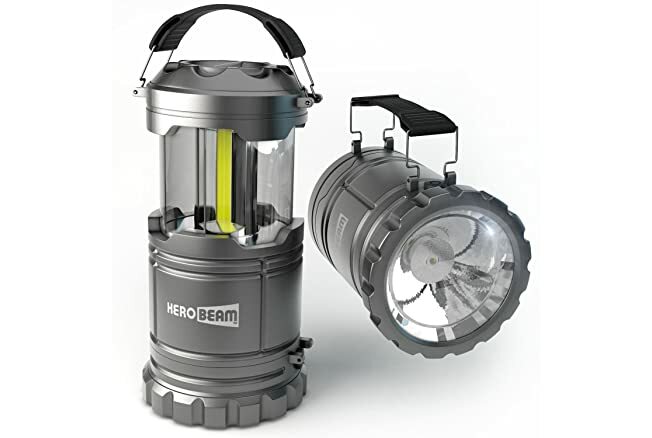 • The Herobeam LED lantern V2.0 has a very rugged outside and it can be used in every weather conditions. The body of this lantern is made by durable ABS, and it has no glass. • This LED lantern is shock proof apart from being water resistant. • This LED lantern is lightweight and compact, which fits neatly anywhere be it a car or a backpack. 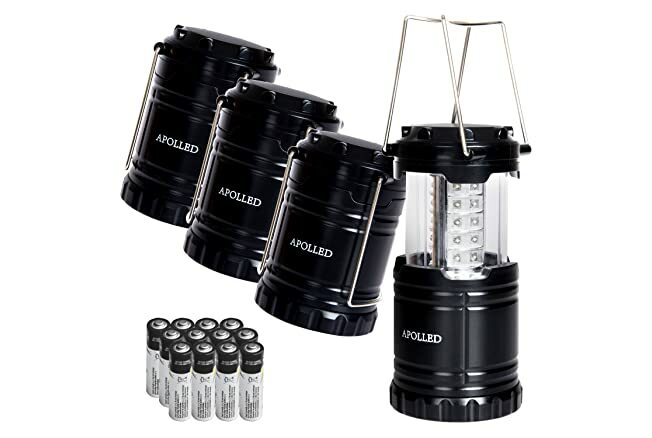 • Some consumers suggested that this lantern is not as water resistant as it claims to be. 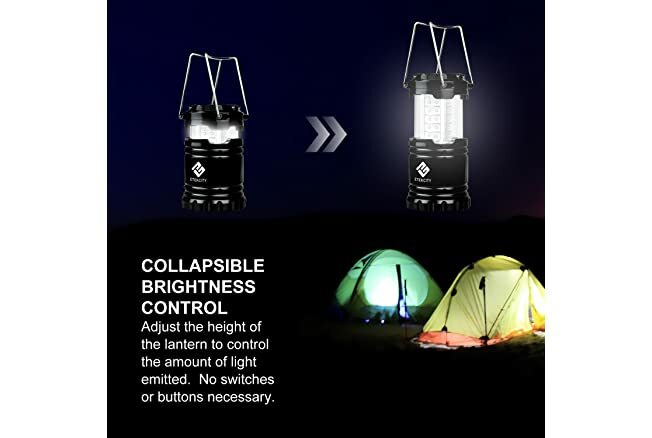 • It lasts for only 8 hours whereas the other LED lanterns have 12 hours of battery life. This updated product comes with 12 AA batteries and emits 350 lumens. The current Chip-On-Board LED technology illuminates more area than the 30 LED lanterns. It’s light is also warmer in color than the competition’s 30 LED lanterns, eliminating that cold, harsh feel. This COB lantern packs more brightness into its compact size than any other lantern, making it over 2X brighter than the 30 LED lanterns. 10-hours battery service. It is water-resistant to withstand weather conditions and collapsing brightest control. This lantern is among best Halloween light and outdoor lantern that is guaranteed to be the topmost standard. The product is lightweight, compact and emits bright light. The lantern offers surprising elements from the moment of un-boxing, inserting the batteries and switching it on. Whether it is used for camping, emergencies or even trick or treating this lamp is going to provide with more than 12 hours of lighting. This lantern features a unique lightweight, compact design this makes this light perfect for travelling. The brightness can easily be adjusted by collapsing and de-collapsing it. No need for complicated setup or any tools. This lantern can easily and simply be operated in the dark. This product has been made from indomitable military grade materials; this multi-purpose LED lantern is perfect for all sorts of needs. This product is hand crafted with maximum brightness, durability and battery life. This lantern will keep the area lit for considerable time. With its advanced collapsible design, it can be told that a lot of attention has been paid to detail to construct a lantern which can best suit your needs. From the moment you unpack the wrap, you will realize that there is nothing out there like it. It is built for multiple uses for getting rid of darkness. • The product has no in-built or any other warranty. How to keep the lanterns durables? Though LED lights are an energy friendly and low maintenance option, you also have to take care of your LED lantern to make it last for years. 1. Never keep these LED lanterns in horizontal position as the cathode and anode placed in the lantern can be displaced due to gravitational force if you don’t place it on a surface. This can really affect the lifespan of the LED lantern. 2. Try to put it in a vibration free area as the vibration causes the intensity of the light to fluctuate more. The vibration leads the cathode and anode inside the lantern to displace more frequently. 3. Do not put the LED lantern in high temperature. If you put it is in high temperature, the electron exchange between the cathode and anode inside the lantern would disrupt and the lantern would stop working. These LED lights doesn’t work properly in low temperature either as the cold weather affects the light or you would notice some discoloration in the emitted light. 4. To maintain the lantern, try to keep it away from water. Most of these lanterns are water resistant but not waterproof. To prevent it put it in a durable plastic cover. It won’t make your lantern waterproof but it can save it for a few minutes. These LED lights are life saver for those campers who love the environment. Using an LED lantern outdoor is greener as it is toxin free and recyclable. LED lights have 50% more lifespan and is 70-80% more energy efficient than the conventional light sources. It can not only save your money, it can give you better and hazard free illumination. The energy it needs is lower than CFL, so it doesn’t get overheated. So with its lifespan, efficiency and ecological factors, using a LED lantern is a much better option than any other outdoor light source. With an LED light lantern you can also take part in the crusade to save our environment.